Our association is a robust and diverse set of educators, researchers, medical professionals, volunteers and academics that come from all walks of life and from around the globe. Each month we choose a member or members to highlight their academic and professional career and see how they are making the best of their membership in IAMSE. This month’s Featured Members are the team presenting a newly-minted workshop at the 2019 IAMSE Annual Meeting in Roanoke, VA, USA. 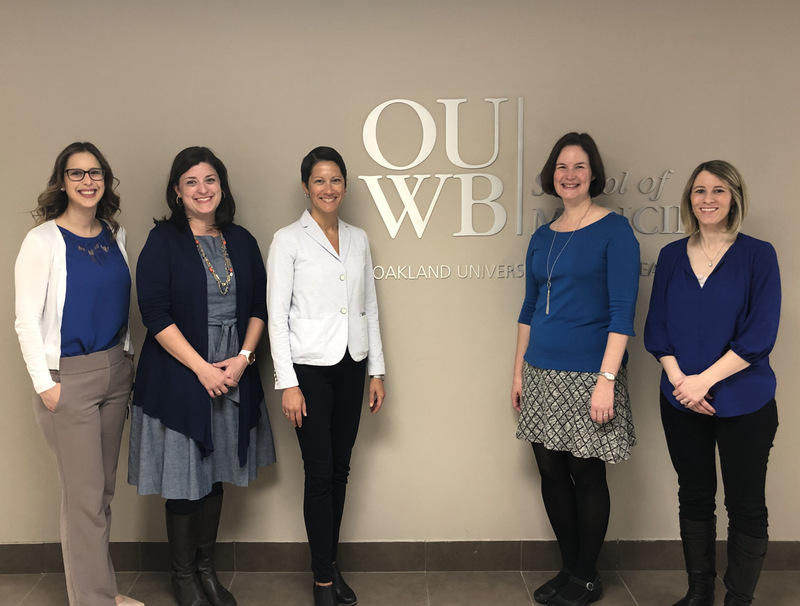 Members Stefanie Attardi, Kara Sawarynski, Rebecca Pratt, Tracey Taylor and Sarah Lerchenfeldt of the Oakland University William Beaumont School of Medicine. 10:30 AM – 12:00 PMWhy is this a perfect topic to cover at the 2019 meeting? The theme for the 2019 IAMSE meeting is “Adapting to Changing Times in Health Sciences Education.” Generational researchers have seen dramatic changes in trends and traits between the Millennials (born between 1980 and 1994), and the new “iGen” or “GenZ” (born after 1994). The iGen/GenZ generation are the very students forming the majority of our current health professions classes. Due to generational differences, experienced educators (most of which are Boomers, GenX or Millennials) might struggle to grasp characteristics unique to this generation; we must re-examine our curricula as what is intuitive to us may not be intuitive to them. This session will help participants to understand iGen/GenZ with an open mind and to possibly adapt our educational strategies to these changing times. How has being IAMSE members helped you to create (or help to create) this workshop?IAMSE provides an open venue for professional development that is neither restrictive nor discipline-specific. We’ve learned a lot by attending and delivering previous IAMSE workshops and webinars and have been inspired to share this topic through this useful venue. For this reason, we specifically developed this workshop with IAMSE members in mind. Medical educators and educators in other health professions have a particular advantage in higher education in that we can work closely with our students to adapt our teaching to be as effective as possible. The members of IAMSE want to become the best educators possible, and therefore it is this group that will be openly interested in learning more about their learners and improving the educational outcomes for our students. What type of activity will participants engage in? Participants will have the opportunity to complete a generational self-assessment activity and discuss where they see themselves in relation to their iGen/GenZ students. After reviewing cases of iGen/GenZ curricular issues, participants will be encouraged to explain unique characteristics of the iGen/GenZ culture and formulate strategies to both adjust their teaching and to help influence student attitudes. Participants will also be encouraged to share their own challenging iGen/GenZ scenarios and success stories from home institutions and receive feedback. So, who should take this session with your group?Any health professions educators and/or administrator working directly with students or influencing student-related policy should attend our session. Students are also highly encouraged to attend this session as their perspectives will add valuable contributions to our discussions. We feel that students will also benefit from understanding the perspectives of educators from a different generation. Anything else you’d like to add or highlight about this workshop? We think that our workshop will be a great learning experience as well as a lot of fun! We think that learning about other generations is an interesting topic for discussion and will allow us time to reflect on our own generation and experiences in our upbringing that make us who we are today. In addition, we will be providing an unbiased, literature-based overview of iGen/GenZ from multiple experts on generational research. To learn more about the 2019 IAMSE Annual Meeting, including the plenary speakers, workshops and networking opportunities, or to register, please visitwww.IAMSEconference.org.